In the October 1998 General Conference, Gordon B. Hinckley said that “our entire case as members of The Church of Jesus Christ of Latter-day Saints rests on the validity of this glorious First Vision….Nothing on which we base our doctrine, nothing we teach, nothing we live by is of greater importance than this initial declaration.” (Page ix.) In April 1984, James E. Faust pointed out that “since no one was with Joseph when this great vision took place in the wooded grove near Palmyra, a testimony concerning its reality can come only by believing the truthfulness of Joseph Smith’s own account or by the witness of the Holy Ghost, or both.” (Page x.) With these statements in mind, it is not surprising that the First Vision has been one of the favorite things for critics of Joseph Smith to attack. In this book, Matthew Brown lays out the historical facts from which one can be helped to gain a testimony of the event, strengthen existing convictions, and help answer any doubts or confusion arising from critics’ claims. The book starts out by giving the background in which the First Vision occurred, beginning with Joseph Smith’s birth and upbringing through 1820. This includes the family’s move to New York (and gives evidence for when it happened), as well as their finances, work, and education. It also speaks of his parents’ religious backgrounds, and of the religious climate in the area at that time, both of which fostered Joseph’s interest in religion. Chapter two goes into detail about the “religious excitement” of the time. Brown gives a local camp meeting in 1818 as a probable candidate for the beginning of the events that led to Joseph’s inquiry in the grove, followed by another meeting in 1819 in a nearby town. There is also evidence given for visits from Methodist preachers to Palmyra in 1819 and 1820. There is a chart included that shows articles from the Palmyra Register about revivals in 1820, as well as a timeline of Smith family relocations from 1816 to 1820. Elements of the First Vision are covered in detail in chapter 3, including the probable date, the location of the grove, the prayer Joseph gave, the opposition he faced as he began praying, the pillar of light and the personages that appeared within, and the instructions he received. The details are taken from many different sources and help the reader towards getting a better understanding of what happened. The following chapter discusses what happened after the vision. It speaks of how it affected Joseph physically, emotionally, and spiritually. It also tells us about those it is known that he told about the experience and why he might have been hesitant to share it, even among his family. The resulting persecution is also discussed, including the account of a Presbyterian woman who lived nearby. The next two chapters talk about what Joseph learned, and whether it was an actual visitation or a vision. The language of the written accounts of the vision is discussed, down to the meaning of significant words. Space is also devoted to the topic of the nature of God, as there have been questions raised as to whether Joseph’s concept of God and the Godhead evolved over time. There are several different versions of the First Vision that were written by different people at different times, and chapter seven gives a thorough analysis of the 1832 account. It is compared to the 1838 account, and it is shown that they are very similar, and that many of the things that critics have claimed are missing in the 1832 version are at least implied. It is also shown that the 1832 account is built on a framework of biblical scriptures, which was probably done to help counteract the negative reactions he had received. It has been said by critics that the First Vision narrative evolved over time, and that many early members of the church during Joseph’s lifetime were not even aware of it. Chapter eight addresses these issues, drawing from documentary evidence relating to William I. Appleby, George Q. Cannon, Oliver Cowdery, Orson Hyde, Andrew Jenson, Heber C. Kimball, Orson Pratt, Parley P. Pratt, George A. Smith, Lucy Mack Smith, William Smith, Orson Spencer, John Taylor, Wilford Woodruff, and Brigham Young. 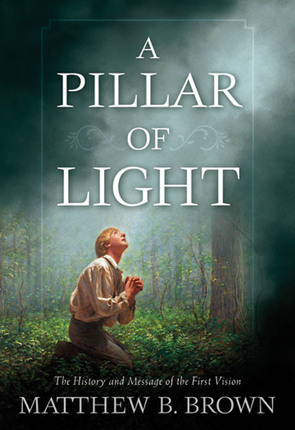 The following chapter then deals with 16 common criticisms, such as “In 1835 Joseph Smith identified his First Vision visitors as angels instead of Deities,” “The First Vision story became more elaborate over time,” “In 1838 the Prophet changed the story of the origin of his prophetic call in order to offset a leadership crisis,” and “The LDS Church seldom publicized the First Vision until after Brigham Young’s death in 1877.” There is also a chart comparing eight different versions of the vision written between 1832 and 1844, which helps to illustrate that there is actually a great amount of consistency between the various texts. The remainder of the text in the book is made up of appendices. The first one includes documents about the First Vision that were written by Joseph Smith and others during his life time. It includes the previously mentioned eight versions, as well as the JST version of Psalms 14:1-4. The second appendix gives a chronological list of recitals and references to the First Vision, from ca. 23 April 1820 to 24 May 1844. It also goes into detail on the 1827 comments from Martin Harris and the 1834 dispute with Mr. Ellmer, which both show that people were aware of the First Vision at those times. Appendix three demonstrates the interdependence of several of the First Vision accounts. For example, it shows that the Oliver Cowdery account of 1834 relied on the 1832 account by Joseph Smith, and that the Smith account of 1838 in turn used the 1834 Cowdery document. This shows again that the various accounts are much more consistent than critics would lead us to believe. Appendix four then shows the dependence of Doctrine and Covenants 84 on the 1832 account, which helps date the 1832 version to between September 23 and November 27. I did find a few small problems with the book, but they are minor and should not detract much from it. There are some typographical errors, and most of the table of contents is off by two pages. The index was also not thorough enough to be as helpful as I would have liked. This book does a good job of covering all the criticisms one might find on the Internet or in certain books. The various accounts are shown to be very much in harmony with each other, and through them the reader can gain a better understanding of the First Vision and the early life of the prophet Joseph Smith. I would highly recommend this book to anyone that is interested in the topic, especially those that have encountered criticisms. The review failed when the book was placed in the genre of “non-fiction”. Marcus, you crack me up! Killer zing! I don’t know how Trevor will be able to recover. Does it incorporate the work Quinn did in his recent paper? We invite substantive, on-topic comments here. If you have something informative to write about Trevor’s post or Matt’s book, please do so. Advertisements for your blog or complaints about FAIR’s comment policy will be deleted. Kent, it wasn’t meant as a “zing” nor was it meant to be funny. It was an honest, sincere review of the book review. Oh, sorry. I’m reading it now in a very different and sober tone. Serious, honest, and insightful analysis. I deleted it because, for all its honesty and sincerity, it has no substance. In fact, it is barely worthy of a “don’t feed the trolls” admonition to other commenters. Do you have something of substance to add that will enlighten us as to why Matt’s book or Trevor’s post is wanting in your estimation? Nope. I couldn’t make it past the “non-fiction” part. That was telling enough for me. Is that enough? If, as a recent Ensign article declared, our eternal salvation hangs on what we think about the First Vision, is it enough for the First Vision accounts to be “mostly” consistent? The old saw “a little bit pregnant” comes to mind, but probably isn’t entirely fair here. History is ambiguous, and even the apostle Paul couldn’t get *his* First Vision account straight. However, it does call into question the justice of God’s supposed conditioning our eternal destiny on our conclusions as to matters about which the evidence is inherently unclear. Do you REALLY think that a cheap-shot comment that discussions of the First Vision do not belong in non-fiction qualifies as a sustantive comment? We KNOW that you disbelieve history, but, unless you are willing to either address specific aspects of either the First Vision (or accounts of it), Brother Brown’s book, or Brother Holyoak’s review, don’t be surprised if we dimiss you as a vacuous troll! I know nothing pisses off the fundamentalist mindset more than introducing nuance and uncertainty into the comfortable black-and-white little bubble they’ve led their whole lives in. But perhaps it’s time for a few people to grow up and embrace a bit of the uncertainty inherent in life. 2. Are there any outright contradictions? I agree that Joseph Smith’s, and his contemporaries’, accounts of the First Vision are little, if any, more uncertain than many Biblical accounts. That takes care of the non-Mormon Christian sectarian critics, hoist on their own petard. I’m not sure it takes care of the broader question, though, of whether *either* Mormon or Biblical tenets are established with a sufficient degree of certainty, that a just God ought to hold it against a person if he declined to accept them. Of course if everything was certain, there would be no room for faith — and our choice to follow the Lord’s truth would show nothing more about us than that we could be bought. The basic question of God’s existence, and His character as a being who requires us to love truth and love our neighbor as ourselves, are propositions that can only be known by faith. However, it’s also true that different people accept, on “faith,” mutually exclusive sectarian doctrines. For example, a Muslim exercises “faith” that Mohammed was God’s final prophet — an article of faith that can’t be reconciled with a Mormon’s faith that Joseph Smith was a prophet eleven hundred years later. Who accepts what revelation seems to be a matter more of the accidents of geography, time, and biological temperament than any other single factor. It would be one thing if a given religion’s sectarian doctrines were established with such certainty that a person had to actively will disbelief. In that case, we could reasonably question whether his decision to do so had immoral motivations, such as cowardice, sloth, or unwillingness to have to curb physical or other worldly appetites. Is the Mormon revelation so thoroughly established? Joseph Smith, who declared that he didn’t blame any man for not believing his history, evidently didn’t think so. I do not understand how a just God, who is no respector of persons, could ordain that a man’s eternal salvation is contingent upon his accepting one sectarian doctrine over another, when acceptance of the doctrine must ultimately be based on a “faith” that could just as well be the basis for acceptance of one such doctrine as another. Now, the religion that Joseph Smith revealed was superior in countless respects to the narrowly sectarian Protestantism he rebelled against. However, the sectarianism problem — the idea that salvation, or other divine favor — is conditional on a person’s acceptance of a doctrine whose acceptance is compelled neither by reason nor morality — is still ultimately present in the Church he restored. The doctrine of vicarious work for the dead takes some of the edge off the sectarianism, but not all. Any criticism for the First Vision usually applies equally to Paul’s vision on the road to Damascus (different versions,etc.). Taking down the LDS church will take down all of Christianity, which is the point. God provides two or more witnesses, and the witness of our faith is (1) the Holy Ghost, and (2) how the doctrine plays out in our daily lives. For example, the Word of Wisdom would save 500,000 lives every year in America alone, and enormously more misery. I’m not sure any other prophet in the history of the world can claim that. So I totally disagree that acceptance of the doctrine is compelled neither by reason nor morality. That’s my opinion. But I must admit, Thomas, I have felt they way you feel more in times past, and still occasionally hear those whispers. Through Obedience with exactness and virtue garnishing our thoughts unceasingly, our confidence will wax strong in the presence of God. George, when I say that acceptance of LDS doctrine is not “compelled by reason,” what I have in mind is that the truth of the *entire LDS corpus of doctrine* (not just good-sense ideas like the Word of Wisdom, which aren’t exclusive to Mormonism) is not so firmly established, across the board, that one would have to engage in willful denial of obvious truth to reject with it. An extreme example of this would be Holocaust denial. The evidence of that historical fact is so firmly established that I would have to engage in willful denial of facts that ought to convince a rational, conscientious person. Irrespective of the independently unsavory considerations that often motivate people to engage in this particular variety of willful denial, denying the truth — *any* truth — is immoral, because it is a declaration that truth doesn’t matter. And if truth doesn’t matter, then there is no basis for any of the other virtues, because then there is no objective basis for classifying love as truly better than hate, or chastity as better than lust. Re: Joseph’s and Paul’s respective First Vision accounts, good point. I made it in my June 19th post, above. Although I’m not sure it follows that “taking down the LDS church will take down all of Christianity.” At most, applying skepticism to Paul’s conflicting First Vision accounts “takes down” the concept of Biblical inerrancy, which (not being a conservative evangelical Protestant) I have no problem with. “As far as it is translated correctly” and all that. The keystone of Christianity is the revelation of Jesus Christ, the accounts of whose life and resurrection can be understood as having been imperfectly recorded by inspired but fallible men without diminishing the basic truth of the overall story. As for the “two witnesses,” I agree that if the witness of the Holy Ghost that comes to a person is sufficiently unambiguous in its reality and meaning, then yes, it’s possible that rejecting that evidence would be immoral and irrational. My experience is that not all people who diligently seek such a witness, obtain it. It is also my experience that other people who declare that they *have* received such a witness, claim its imprimatur for notions that are factually false, or at least subject to dispute. See, for example, the criticism on this board of people who claim the authority of a spiritual witness as support for their favored theories of Book of Mormon geography. One person says the Spirit has revealed X to him. Another person says the Spirit told him Y. If X and Y do not contradict each other, both people may be justified in choosing to believe that the impressions they experienced were divine communications. I do, in fact, experience impressions like these, and I choose to interpret them as evidences of God’s presence, His endorsement of certain principles, and His approval or disapproval of aspects of my life. On the other hand, if X and Y are inherently at odds — for example, if Xavier believes his impressions are a confirmation that the Roman Catholic Church is the one true church, and the Jared believes *his* impressions are a confirmation that the LDS Church is the true church — then we have a problem. A sectarian deadlock. Unless Jared can get inside Xavier’s head, and be fairly convinced that what Xavier experienced was fundamentally different from what Jared experienced, what is Jared’s basis for believing he’s right and Xavier’s wrong? So often in history, the response to this question has been for one of the parties to try and chop off the other’s head. Sectarianism kills — maybe even more than tobacco. We’re more civilized nowadays, of course; instead of firing up the literal autos-da-fe, we just divorce our unbelieving spouses, disown our wayward children, and spread nasty rumors about why that guy down the street *really* started questioning things. Of course decent people can practice Mormonism without falling into these traps. And of course no religion can be made completely idiotproof, and maybe I’m nitpicking here; at least Mormonism, when abused, doesn’t get people strapping on suicide bomb vests. I’ve just seen real pain caused by the Mormon flavor of sectarianism, and seen good men tarred with an unjustly broad brush, and I wish there were some way around this. I think your question, “I’m not sure it takes care of the broader question, though, of whether *either* Mormon or Biblical tenets are established with a sufficient degree of certainty, that a just God ought to hold it against a person if he declined to accept them,” is a good one–and one that I DO take seriously–despite the seemingly dismissive tone. 1. Much information is simply beyond our constraints. For example, we don’t have the resources to go back in time to Spring of 1820 to witness the event. 2. Even if the information is within our constraints, much of that information is simply too costly for the benefits provided. And, when there is truly rational ignorance, I do not believe that God would hold failure to know against them. If He did, why would He command us to be baptised for them after they die? I hope I didn’t give the impression of dismissiveness. If I did, it was just to get the argumentam ad it-takes-out-the-Bible-tooam out of the way quickly, by simply stating that I agree: The Bible’s got its own problems. As for the basic point: we’re in agreement, as far as I can see. What you’re saying is similar to the Catholic doctrine that people are not held responsible for “invincible ignorance” — that is, ignorance of truths despite reasonable diligence in seeking truth. I think the modern Church has more or less the same position, although it’s not expressly spelled out and there are still some schools of thought within Church culture that define the Mormon version of “invincible ignorance” quite narrowly. In essence, these views say that if the missionaries taught you, and you didn’t get baptized, or if you were born in the Church, but left, you can’t claim not to have had reason to know the Church was true, and you will be punished for your rejection of it. My experience has been that being familiar with LDS doctrine, hearing the missionaries, or even being immersed in Church culture from birth is not necessarily enough to furnish every person with sufficient grounds for belief in the Church’s teachings, that such a person’s nonbelief should be held against him. There are individual Church members and leaders, as well as aspects of more or less official teaching, that are in accord, although there are other aspects of teaching that suggest otherwise. An example of the latter might include the recent Gospel Doctrine lesson on apostasy (focusing on “being offended” and “rationalizing sin” as the main reasons people choose other religious paths).